Damian Collins speaks in a group meeting in the library. Credit: Silver Apples Photography. 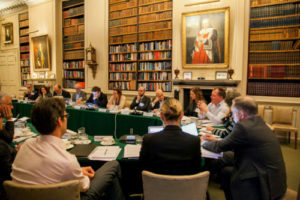 Members of the Transatlantic High Level Working Group on Content Moderation and Freedom of Expression held their inaugural meeting at Ditchley Park, in the U.K., from February 28-March 3, 2019. The group, a project of the Annenberg Public Policy Center (APPC), is dedicated to reducing the amount of hate speech, violent extremism, and viral deception online while protecting freedom of speech. At Ditchley Park, the group heard from keynote speakers Damian Collins, a British M.P. and chair of the Digital, Culture, Media & Sport select committee; David Kaye, U.N. Special Rapporteur for Human Rights and Freedom of Expression, and a professor of law at the University of California, Irvine; Timothy Garton Ash, Professor of European Studies, University of Oxford, and Senior Fellow at the Hoover Institution, Stanford University; and Judge Róbert Spanó, European Court of Human Rights. Group meetings and breakout sessions focused on case studies of laws and regulations that attempt to restrict hate speech and terrorist content on the internet. The Transatlantic Working Group is led by Susan Ness, an APPC distinguished fellow and former member of the Federal Communications Commission, and Nico van Eijk, director of the Institute for Information Law (IViR) at the University of Amsterdam. For more information see the TWG page at IViR, the project’s lead European partner, or the news releases about the TWG’s formation and first meeting, biographical information about its members and its mission.